Getting white teeth for that great smile isn’t easy. Let’s face it – nearly all of the tasty foods we eat may possibly stain our teeth. Even if you brush your teeth after every meal, you’ll find that your teeth can’t get as white as you’d like.Tooth whitening is an affordable and effective way to combat common causes of tooth discoloration, while boosting your self-confidence and improving your appearance. It has been said that the easiest and least expensive way to look ten years younger is to whiten your teeth. We offer two whitening systems to fit our patients’ lifestyles and budget considerations. 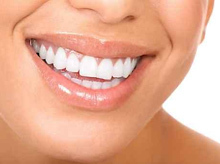 Many factors, including dietary habits (drinking coffee, tea, soda, and red wine) and certain medications, affect the whiteness of your smile, and when you require a significant shade change, we suggest an in-office whitening, which is a chemically activated treatment that offers amazing results in about an hour. This dentist-supervised, in-office procedure is safe and effective, and offers a brighter, whiter smile after just one appointment. When you need to maintain your existing pearly whites, or if you’re just looking to change 1-2 shades, we suggest a take home kit with whitening gels, which are delivered via customized bleaching trays. The sticky, viscous gel won’t migrate to gums, and most formulations (of both in-office & take-home kits) include Potassium Fluoride (PF), which helps to improve oral health by strengthening enamel, decreasing sensitivity, and offering increased cavity prevention. Take Home Whitening Gels can provide results after just one night, though expect to see results in about a week. Before using either system, patients should have a comprehensive exam and cleaning done to evaluate if they are a good candidate for such whitening methods. Some patients are not ideal candidates, due to reasons such as the presence of crowns or other cosmetic dental work. Natural teeth will lighten, but crowns, veneers, and bondings will not.